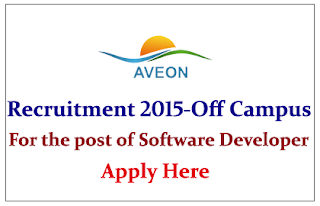 Aveon Infotech is recruiting for post of Software Developer Trainee for the 2015 passed out Batch. Eligible candidate can attend the off campus drive on 9th May 2015. Aveon Infotech an ISO 9001 : 2008 Company offers world class information technology solutions including software development, maintenance services, and consultancy services, products across various platforms, applications and verticals. 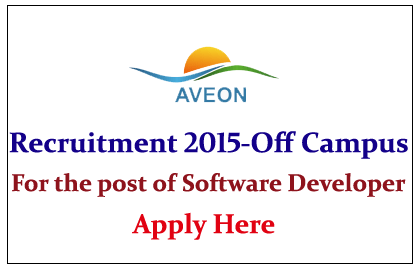 Aveon provides these cost effective outsourced services for companies in Europe, United States. At first the selected candidates will be in training of Rs.10,000. Based on their performance they will be observed and will be given a hike up to Rs.15,000. Eligible Candidates can apply online on or before 08 / 05 / 2015, for more details check official notification. 3. Shortlisted Candidates will be sent Hall Ticket mail on or before 08.05.2015. 4. The candidates are instructed to bring their 2 copies of Resume, 4 copies of recent passport size photograph, Writing pad and photocopies of Mark sheets while attending the interview process. 5. The candidates are instructed to be present in KIOT on 09.05.2015 at 9:00 am.